Rode is one of those brands that I can’t seem to get away from at trade shows like CES and MWC. The company makes some extremely popular directional microphones, which I see mounted atop video producers’ cameras with big and bold RØDE lettering adorning their sides. As a result, I had grown to associate Rode with pro audio recording even before I’d tried any of its gear for myself, trusting the collective wisdom of the professional content creator crowd. Having spent the past few weeks reviewing the Rodecaster Pro, I’d say that wisdom is spot on. 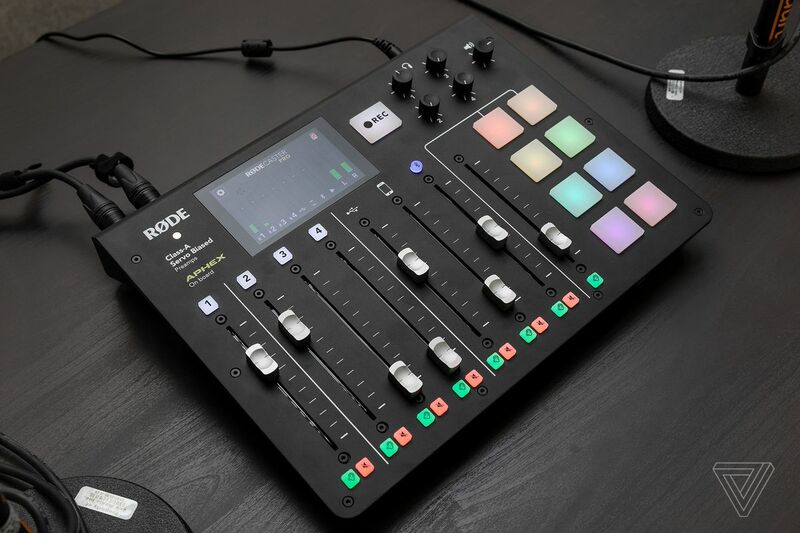 The Rodecaster Pro is meant to be a full podcasting studio in a transportable format: it combines four XLR microphone inputs, Bluetooth and USB connections for mobile devices, four monitoring headphone outputs, and eight programmable pads for playing jingles and sound effects. It’s an extremely ambitious piece of audio kit. Just to make the point, the company shipped the review device to me in a customized backpack, which also managed to fit two large Procaster microphones, their hefty stands, and some extremely thick and long XLR cables. Without those extras, the Rodecaster Pro costs $599; with them, it’s pushing past $1,000. So who is this studio-in-a-backpack for? That’s a good question. The vast majority of consumer tech is made for one user at a time. Some gadgets are shareable, such as iPads, but it’s hard to think of many devices that are designed for actual group use. The Rodecaster Pro is one of those rare exceptions. It’s built to withstand a lot of punishing use, with big, mashable pads, hardy sliders, and robust knobs, but you absolutely will not get the most out of it if you’re using it by yourself. Though it’s marketed to catch the eye of podcasters, the Rodecaster Pro feels like overkill for that task. It’s far too powerful (and expensive) to be considered a logical upgrade from a more basic USB podcasting mic setup. It’s definitely an upgrade: the internal circuitry of this machine, combined with those $229 Procaster microphones, leads to truly high-fidelity recordings. But podcasts allow you a lot of leeway to finesse a recording in post-production — you can inject musical interludes, rebalance and isolate voices, and do a smattering of refinements to captured audio — which makes some of the Rodecaster Pro’s capabilities superfluous. At the same time, it’s not quite as fully featured as a proper studio, so it occupies an uncomfortable sort of middle ground. Verge audio director Andrew Marino, who’s also had experience with the Rodecaster Pro, notes that its built-in effects options are limited (compression is a binary choice of on or off), and he reckons that the Rodecaster is better suited to multiperson live streams than anything else. It’s when you’re recording live, especially at a remote location, that this portable broadcast production station shines. The size of the Rodecaster Pro is comparable to that of a binder, and its setup is almost as simple. Every control dial, slider, and pad is sensibly labeled, and I was able to get all of the connections plugged in and operational without needing to consult a manual. Rode still provides a large card with tips and guidance, in any case. 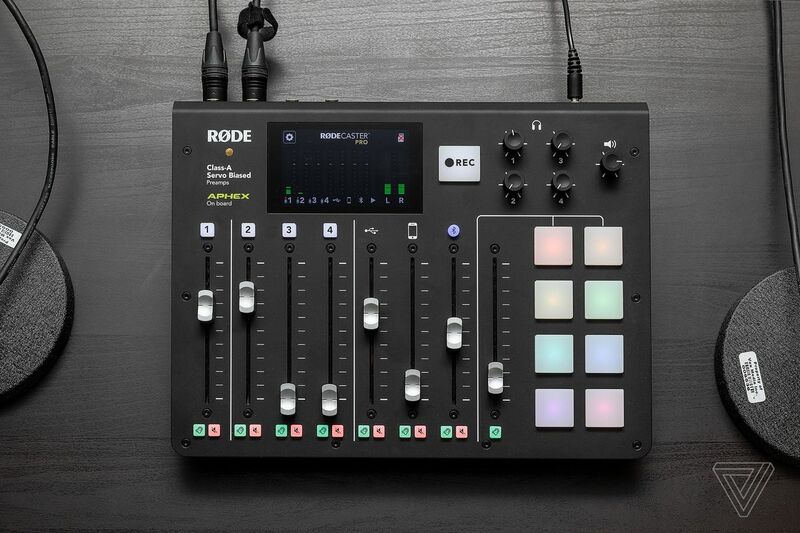 With the recently released version 1.1.0 of the Rodecaster Pro firmware, Rode added two neat upgrades: one is color labeling for each mic channel, so that you have a visual cue to which one you’re adjusting in the settings menu on the touchscreen at the top, and the other is multitrack recording when plugged in to a computer. I mention this because, with gear of this kind, it’s not immediately obvious how much support you’ll get after the initial purchase, but Rode’s rolling out meaningful new features and treating the Rodecaster Pro like a flagship product. I also really appreciate the responsiveness and readability of the touchscreen: displays are an often neglected aspect on audio equipment, and it’s nice that Rode has bucked that trend. A microSD card slot on the back lets you do an entire stereo recording without the need for a computer. There’s also a bidirectional USB-C connector that will accept input from your Mac or PC (while simultaneously sending the audio out to your favored editing software like Audacity, Adobe Audition, or Hindenburg). 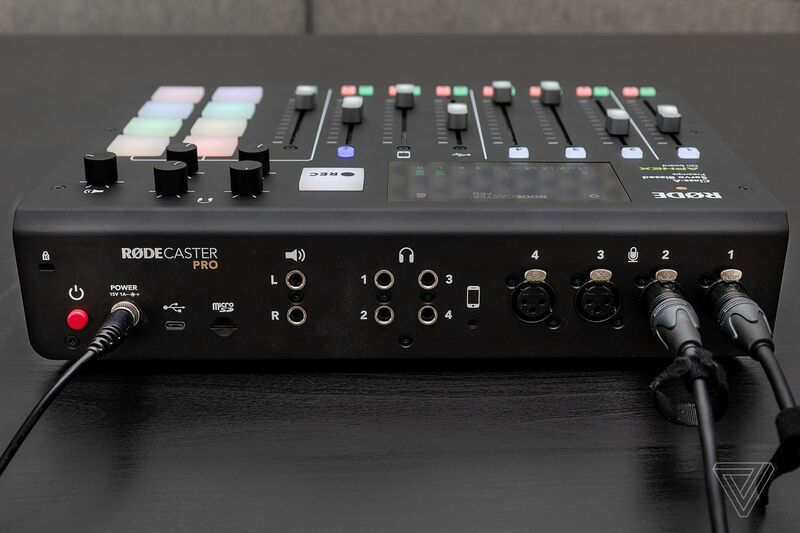 Whether hooking up via USB or Bluetooth to your phone, the Rodecaster Pro makes it super easy to record high-quality interviews with someone who’s remote. With its eight programmable jingle pads, you can also do plenty of on-the-fly production as well, underlining the Rodecaster’s credentials as a great live show base station. The more reviews of creator gear we do, the more obvious it becomes to me how much more narrowly focused creative devices are than consumptive ones. A smartphone can do everything decently, but it can’t match the video stabilization of a DJI Osmo Pocket or the audio recording of something like Shure’s MV88+ kit. When you want to raise the quality ceiling of your creative endeavors, you necessarily have to buy hardware that’s tailored to those activities. The Rodecaster Pro is one of those pieces of equipment that will make a few people’s lives infinitely easier while making little sense to the rest of us. More than anything, I’d stress the Pro part of the Rodecaster Pro’s name. The inviting color coding, large pads, and accessible design all hint at Rode’s desire to make professional gear more friendly to amateurs aspiring to take the next step up. But make no mistake about it: the Rodecaster Pro is a step right into professional audio broadcasting and production. You’ll have to be sure it’s exactly what you want before taking that leap.